We added several counseling days to our suddenly-open schedule, and met up with a number of people for meals, walks, or just hanging out. 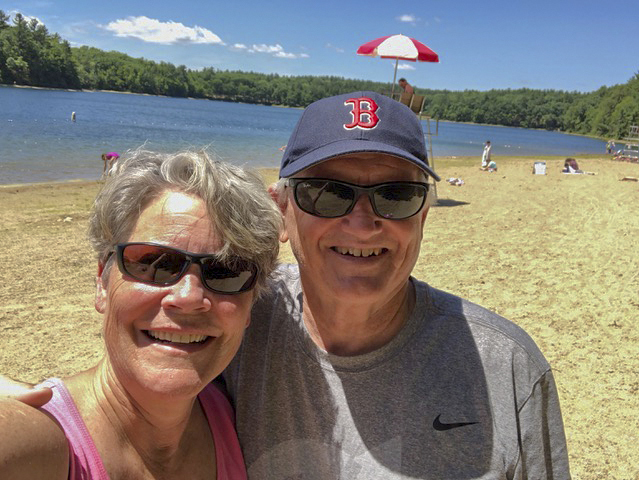 We took a few walks around Walden Pond, many walks on the bike trail, and chatted with our neighbors. We went to church three weeks in a row: as attendees and not as speakers. We enjoyed the blooming season of peonies, rhododendrons, dogwoods, and lilies. I was thankful to be able to attend two of the New England Patriots off-season women’s studies. And we were home to welcome several sets of out-of-towners, which was delightful in itself. Is there anything sweeter than peonies?? 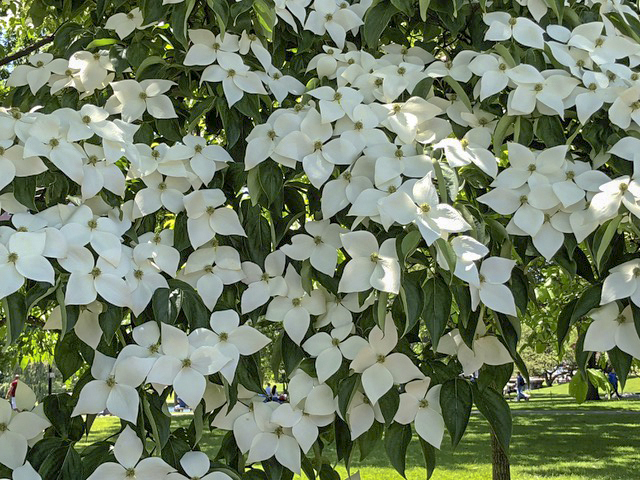 Dogwoods are lovely too . . .
After church in downtown Boston, we walked through the Public Gardens . . . always a favorite thing to do! Walden Pond . . . such a lovely retreat! My cousin Frank Phillips (far right) and his wife Annette came to town to visit their son Jamie and his wife Brittany and we spent a lovely evening together over dinner. Celebrating my dear friend Patty’s 60th with a couple of other dear friends. "Mom to Mom" brought us together in 1995 and we’ve been fast friends ever since. And I have had many doctors appointments, as well as a “bronchoscopy,” which is an outpatient surgical procedure to biopsy the nodule residing in my upper right lung lobe. It was a great relief to meet with the interventional pulmonologist 10 days later for the biopsy results, which confirmed that I have “cryptogenic organizing pneumonia.” It will most likely be treated with a long term course of prednisone. That will hopefully close the chapter on this interesting three-month health journey I’ve been on since originally being diagnosed with pneumonia on March 28. Maybe the sweetest silver lining to this unexpected “canceled” month was being able to be with the Johnsons in Grand Rapids, MI, for our lively 2-year-old granddaughter Rachel’s hernia surgery. Expected since her birth, the surgical repair of three small hernias was scheduled for June 8, and I was so thankful to be with them for this outpatient event. She came through like a champ, thankfully, and was none the worse for the wear a week later. It was a great joy for me to help out with Nathan while Derek and Julie took Rachel in for her surgery. It was also such a delight to experience their new life in Michigan, which included going to their church, visiting their newly discovered parks, meeting their neighbors and friends, and falling in love with their newest furry family member: Sammy, the Bernadoodle! Rachel (and Julie) post-op. She wasn’t too thrilled with the whole deal at this point. But receiving flowers from her Great Auntie Laura perked her right up. Give a boy a tree . . . Nathan, in his element! I flew straight from Grand Rapids to Indianapolis to attend The Gospel Coalition’s Women’s Conference. Kari and Lisa joined me there and we spent three days being spiritually fed and energized. 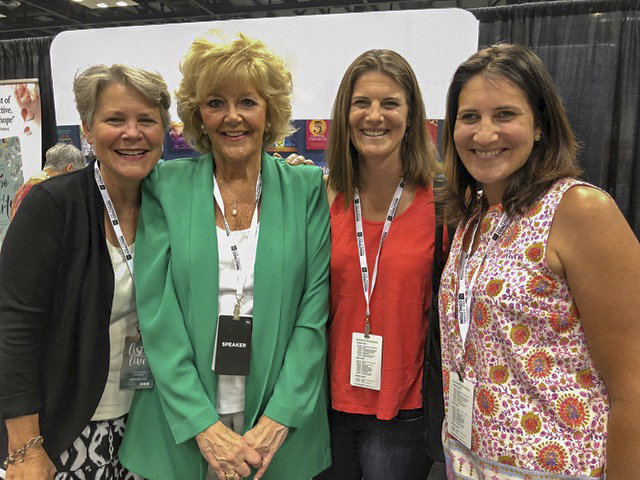 The conference, attended by over 7,000 women from all 50 states as well as 27 countries, was full of solid, gospel-centered teaching and inspiring worship. Hearing the book of Deuteronomy exposited during the plenary sessions was both challenging as well as interesting, and the workshops I attended were inspiring. Becky Manley Pippert’s workshop on sharing the gospel was so refreshing. Her approach to evangelism is so natural and real and her passion for sharing the gospel is truly contagious. And Rosaria Butterfield’s workshop on her newest book, The Gospel Comes with a House Key was a true highlight. I’ve had such deep respect and appreciation for Rosaria since reading her first book, Secret Confessions of an Unlikely Convert, and it was a fulfilled desire to hear her in person. She’s is articulate, wise, and a great story teller, and I hung on her every word. 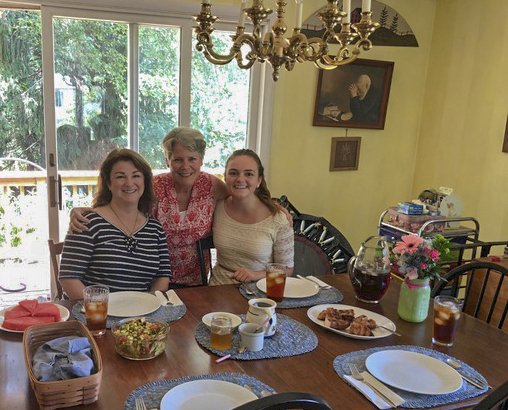 In between the sessions, Kari, Lisa and I had many sweet moments of fellowship, many cups of iced coffee, some great walks, and a few great meals together. We all wished Julie had been able to join us, but her work schedule prevented that from happening. We’re all hoping to attend the conference together in 2020. Happy reunion with Kari and Lisa in the Indianapolis airport. The Gospel Coalition Women’s Conference was phenomenal. Check it out for 2020, ladies! 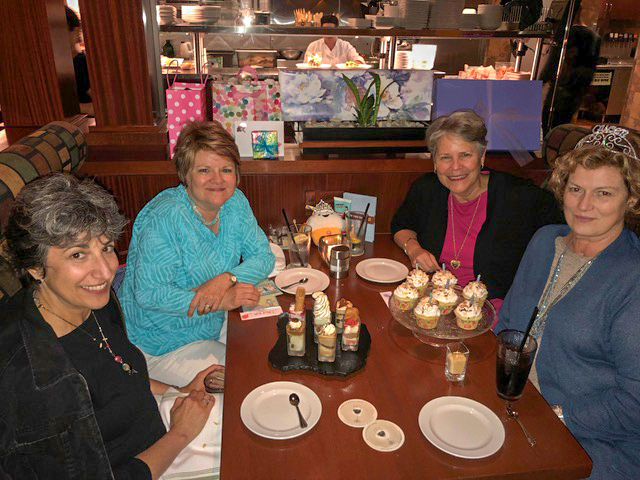 We were so happy to meet up with Victoria, Grace, and Esther Flint at the conference. Grace (in the middle) served on our CBS program staff in 2016 and her family attended family camp. It was a gift from heaven to have some time with them at the conference. Becky Manley Pippert has been a dear friend since 1972, when she and Paul went on IVCF staff the same year. It was a delight to hear her speak and while it’s hard to believe she’s gotten better with age since she’s always been incredible, she has! Kari and Lisa heard her for the first time and they gave her highest marks. Sunrise walks every day of the conference was the best way to start the day. Back to Boston on Father’s Day for a week and change before leaving for Viet Nam, we had two more counseling days, a HIM Board Meeting, several out-of-town guests, and times of preparation for the rest of the summer, which will be very full of speaking and traveling. Keri and Kelsey Telander (long time family campers and former CBS program staff) honored us with a visit on the way to the airport after going to a wedding in Maine. And Steve, Lisa, and Jewelina Culcasi also hung out with us—another CBS family camp family. How kind of the Lord to bring these deeply missed campers/friends our way!! Dear Helen (who actually served on staff at CBS in 1978 and 1980) spent a few days with us as well, which we always consider a gift. Though full of many great moments, this period has had the undercurrent of pain that our second summer of “no traditional CBS family camps” is underway. At this time last year, we had great hopes that in 2018 the CBS family camp ministry would be restored. So though we are thankful for the opportunities the Lord has given us, and we are loving the new experiences we’re having sharing the gospel of marriage and family with new people and cultures, our hearts still grieve the loss of our lifelong involvement with and investment in families connected through the generations at CBS. Our hope and comfort is in the faithfulness of our sovereign God and we continue to trust Him for our future ministry, whatever that looks like.